The new Board: from left to right: Jane Gawronski, Scott Therkalsen, Drew Wilson, Tom Gawronski, Pete Ruscitti, Rae Hartigan, Andrew Waltz, John Ambert and Seth Connolly. 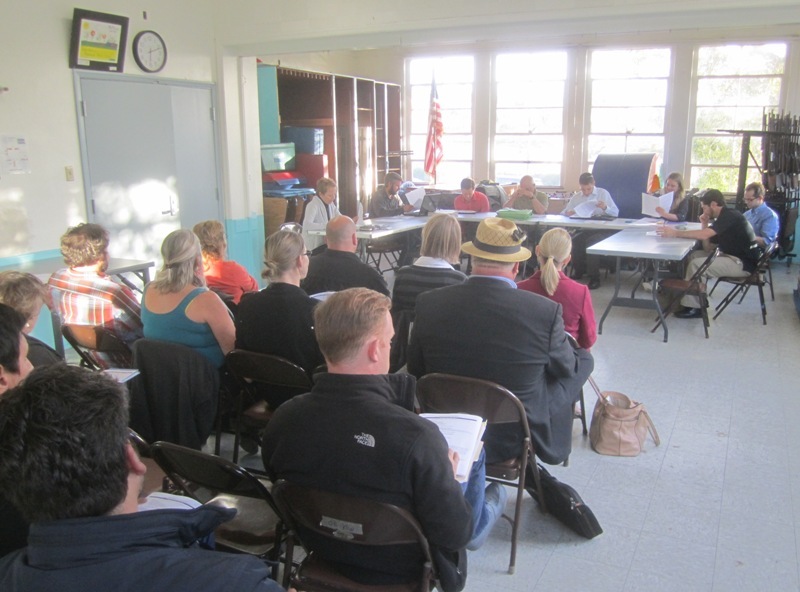 At their monthly meeting last night (Wed., April 2), the Ocean Beach Planning Board appointed two new members and elected their officers for the upcoming year. Two veterans of the Board, Jane Gawronski and Seth Connolly, were appointed to vacancies on the normal-14-member Board. Jane was appointed to District 5 and Seth to District 4. With the departure of Barbara Schmidtknecht from the Board, and with the additions of Connolly and Gawronski, the Board now stands at 11 members. 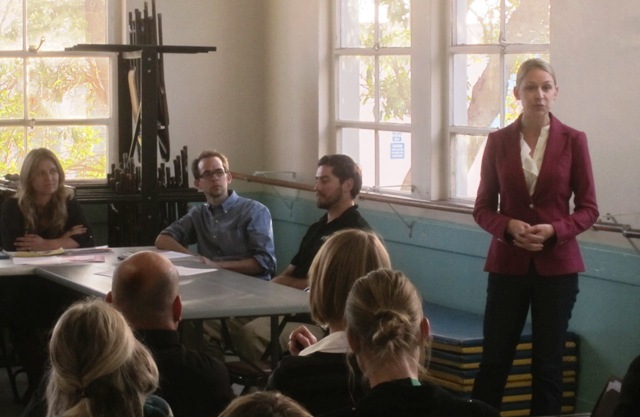 City Council candidate Sarah Boot addressed the crowd at the meeting. Tom Gawronksi announced that Board member Bill Bushe is having major medical problems and he doubted that Bushe would be able to return to his seat. For those who are seeking future appointments to the Board next month, there are 2 confirmed vacancies in District 1 and 7, and maybe a vacancy in District 4. Once the dust had settled on the appointments and the new members had taken their seats, the Board turned to electing new officers for the upcoming year. There were no contests between the members for the positions. Pete Ruscitti was chosen as the Chair – he had been the Vice-chair; John Ambert was selected to be the new Vice-chair and Chair of the Project Review Committee; Scott Therkalsen is continuing as Secretary, and Drew Wilson agreed to be the Treasurer. The applicant’s representatives present the project to the Board. Up next on the agenda was the proposed project at 4945-4947 Muir. 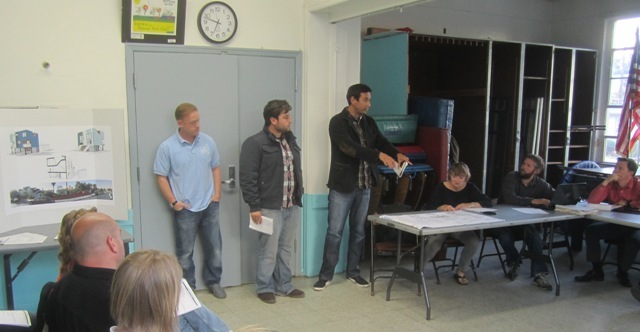 The applicant’s reps presented their plans to demolish the rear building built in 1916 because it is seriously infested beyond repair with a fungus that attacks wood, along with the adjacent one car garage, and construct two one-bedroom units in their place that will appear to have two stories with parking underneath. The 3 bedroom front house will be maintained with cosmetic improvements. Muir project approved by Board. 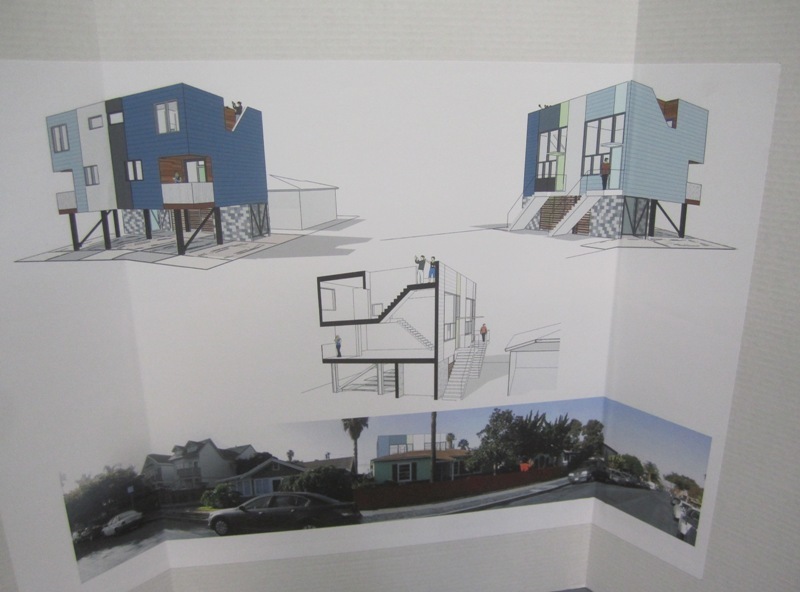 Diagram shows rear units and photo shows how the project will appear at street level. Several neighbors were in the audience and had questions for the developers. The Board then launched into its own discussion, which included some of the following points: the 1916 cottage cannot be seen from the street, the rest of that block already has 2-story developments, the new project will include 5 offstreet parking spaces, and that it would be okay to approve the project while it awaits a map waiver from the City. The motion to recommend approval of the project on the condition that the applicant obtains the map waiver for the conversion of units to condos, was made and seconded. The Board voted 9-0-0 to approve it. 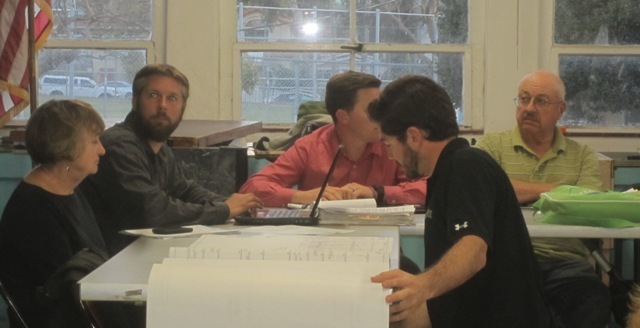 OB planners review the plans for the Muirlands project. Thanks planning board guys and lasses – for hanging in there, doing as the article says, a thank-less job, and thanks for appointing a tenant to your board. It’s amazing how many people are watching the board without actually benin in the meeting.